Carmelo Anthony has been hitting strides for the New York Knicks lately, leading the Knicks to huge victories that landed them a stint on this year’s NBA Playoffs. Anthony, who recently recorded triple double and has also erupted for 43 points a few weeks ago, could also make waves with an eye-catching edition of his eighth signature shoe with Jordan Brand. The Jordan Melo M8 could be coming out in a “Blue Suede” edition – the same shoe Melo was wearing when he torched the league-leading Chicago Bulls with his 43-point performance. 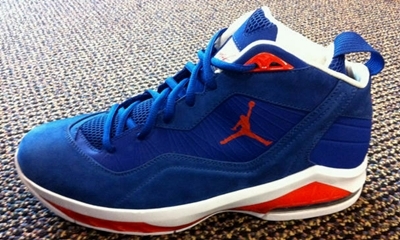 The silhouette sports the Knicks’ blue suede over the upper part of the shoe, which is accented by touches of Team Orange for the Jumpman logo and on the white midsole. We will be keeping you updated with this impressive kick from JB. Watch out for it!